Home improvement projects can be dangerous. Many tasks call for sharp tools or power tools that can cause injuries. You can’t successfully repair or tackle home improvement projects your home if you’re not careful. With a little careful organization and forethought, even the most difficult home improvement tasks can be conquered safely and successfully. Be sure to completely read the instruction manual for your power tools and follow the manufacturer’s safety cautions. Tighten any adjustments and check that the guard is working before you operate a tool. Keep power tools dry, and plug them into grounded electrical outlets. Take care not to cut the power cord. Never store your power tools while they are still connected to the power supply. Keep fingers well away from a power blade. Clamp small pieces of wood before cutting them, rather than holding them. It’s imperative to wear work gloves when you’re handling rough materials such as wood, glass, or metal, but take them off when using a power tool so you have complete control over it. Never use any kind of power tool without proper protective eyewear. Unplug a power saw before changing the blade or doing any other kind of maintenance or cleaning to it. Learn how to properly support a board when you cut it with a power tool so it doesn’t kick back towards you during use. Always completely shut off power or water when working with the electrical wiring or the plumbing. One of the first questions you should ask as a new homeowner is where your shutoffs are located. When working on a ladder, don’t lean out to either side. Keep your body weight between the sides of the ladder. It may take longer to get off the ladder and move it to reach farther, but it is well worth your time. Falls are one of the most common causes of injuries in the home. 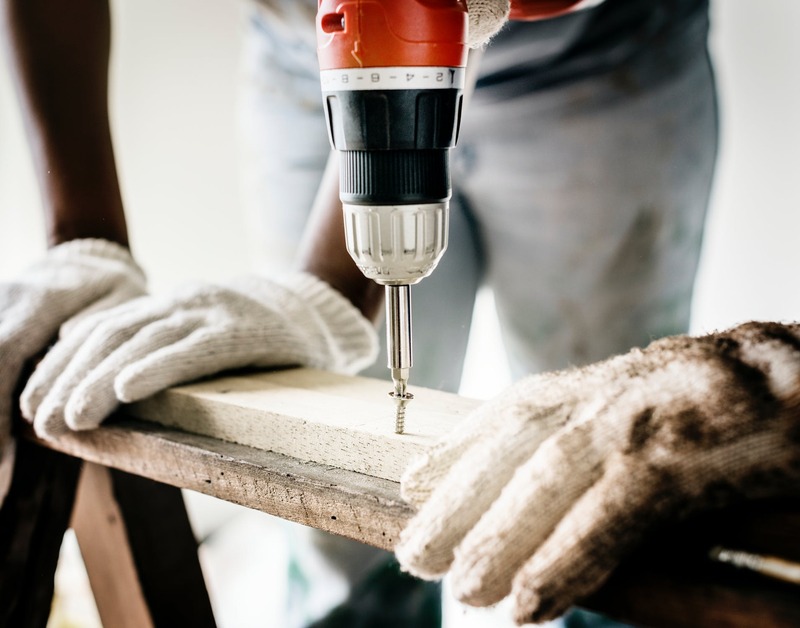 If you’re not used to the physical element of doing construction, remodeling, or renovation work, you might easily injure yourself or strain your muscles. You may not even notice the aches and pains until you wake up the next day. Don’t take chances and overexert yourself when lifting heavy objects, or when repeatedly lifting lighter loads. Get a helper to do some of the work, and take plenty of breaks. Listen to your body’s signals and realize when enough is enough. Learn to bend and lift with the knees and not your back. You’re going to find a great satisfaction and pride knowing that you’re able to safely and successfully accomplish repair, remodeling and renovation projects around your house as long as you’re smart, safe, and keep yourself organized, focused and on task.